Looking for a great way to celebrate Valentine’s Day with someone special? Branson offers a variety of excellent options to make it the perfect day. Black Oak Grill: Begin with your choice of a tomato basil soup or wedge salad, next choose between a center-cut sirloin or salmon, and then choose your dessert: New York strawberry cheesecake or a Kahlua ding dong. This menu is available February 9-14. 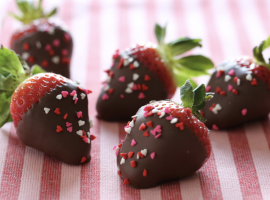 Branson Center Stage: Enjoy chocolate covered strawberries, an appetizer trio, dinner salad, entree, and a dessert. Reservations are highly recommended. Florentina’s: Start your meal with Italian nachos and garden salads. Then share Paolo’s favorites including: lasagna, fettuccine alfredo and spaghetti topped with marinara sauce and Italian sausage. Finish with a special Valentine’s Day dessert. Receive a $15 gift certificate to be used on your next visit before March 31. Keeter Center: The Keeter Center will be offering a special candle-lit dinner on Valentine’s Day. There will be a four-course meal along with dancing, live music, and a sparkling cider toast. Reservations are recommended. Little Hacienda: Celebrate with a live mariachi band and DJ! This event takes place Friday, February 16 from 5-11pm. McFarlain’s: Enjoy a 10oz. Prime rib served with a baked potato, garden salad, corn bread, and dessert. As a special bonus gift, you’ll receive a $15 gift certificate that can be used on your next visit through March 31. Montana Mike’s: Start with campfire shrimp, then enjoy bone-in ribeye or filet mignon, with a baked potato, side salad, roll, and a special dessert. Also receive a $15 gift certificate to be used on your next visit through March 31. Another amazing option for this special day is to take a Valentine’s Day Cruise. Enjoy a delicious dinner with breathtaking views while onboard the Landing Princess at Main Street Lake cruises! After dinner, how about an evening of shopping or going to see a show? Check out the stores at the Branson Landing or Tanger Outlet for special deals and events. There are also several shows offering shows on Valentine’s Day. These include: The Grand Jubilee, SIX, Eagles Tribute, Motown Downtown, and Dublin’s Irish Tenors and Celtic Ladies. With so many options, it will be easy to plan the perfect evening! Make it special and celebrate Valentine’s Day in Branson!